Welcome to the PKD Foundation of Canada's September e-News! We have provided information important to helping you take action in your journey with PKD. Sept. 4th's PKD Awareness Day - A Great Success! New Record Set for Mayoral PKD Proclamations! In addition to Health Canada recognizing September 4th as National PKD Awareness Day, this year we also saw a record-setting 20 Mayors in cities and towns all across Canada join the fight to END PKD! This support is so important to the PKD community and helps to elevate visibility of this disease and the impact it has on 66,000 Canadians nationwide. The PKD Foundation of Canada wishes to extend our heartfelt gratitude to each and every Mayor who supported this year's proclamation campaign! We are already looking forward to garnering more support in 2019! If you would like to help the Foundation secure a proclamation in your city or town next year, drop us a line here and we'll be sure to connect with you when we start rolling out next year's campaign. PKD Teal Shines Bright on Sept. 4th! 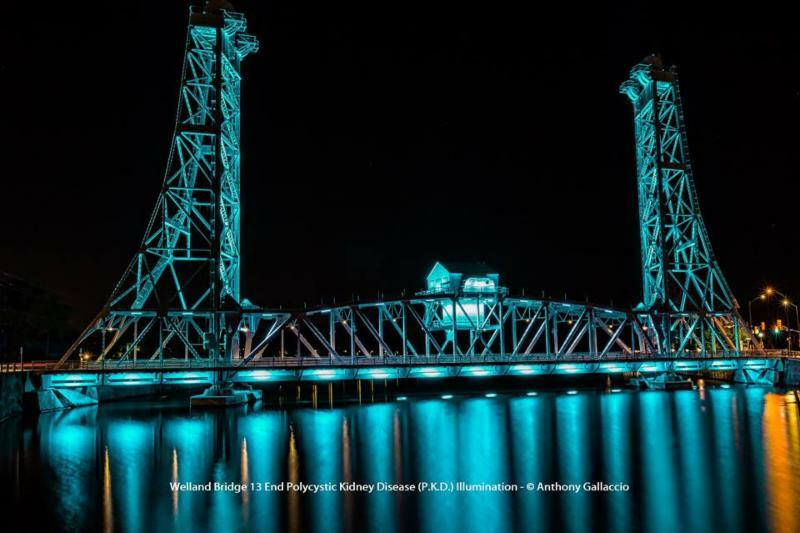 A special thank you goes out to the Cities of Edmonton and Welland for shining an even brighter light on PKD Awareness Day by illuminating the High Level Bridge and Welland Street Bridge teal, the official color of PKD and the PKD Foundation of Canada! There is no way one could have missed these beautiful monuments shining bright in support of the PKD community. Truly two beautiful sights to see! There's Still Time to Register for the Toronto Walk to END PKD! The Walk to END PKD signifies a united group, moving towards treatments and a cure for PKD, one of the most common life-threatening genetic diseases affecting thousands in Canada. While the Montreal, Guelph and Ottawa events are behind us, there's still time to join the Toronto Walk to END PKD taking place on Sunday, September 30! In Valen's most recent blog, she reminds us to trust our gut and listen to our body. "Being a patient takes work and dedication. Depending on our health status, it can feel like a part-time to full-time job. It is a constant learning process and important to find a balance between our health challenges and everything else in life. We don’t want to get consumed by our appointments, our medical tasks and how we feel, but rather try to lead the best quality of life despite what we are going through. "Read her full blog post here. Join us for Halloween fun with the Hamilton Chapter! Come for a family-friendly Halloween dance party complete with DJ, silent auction and activities for the kids! Admission Info Tickets available through the Hamilton Chapter Coordinators or at the door. $10 per ticket - includes one pizza slice. $35 per family - includes up to six pizza slices. Admission includes an apple for each person and a Halloween treat! Additional pizza, refreshments and spirits can be purchased at the bar. View the event listing on our website. *Activities may have a small additional fee to help raise funds for this amazing event*We hope to see you there! Join the Toronto Chapter as Sandee Sharpe presents Challenge, Change & Choice, a description of her ongoing PKD journey as she continues to seek out Western advances in treatment and holistic approaches to overall health. Those incidental (completely unexpected) findings - some out of the blue, and some related to PKD that I had never heard discussed before, so let's bring them out into the open. Let’s navigate our journey together with insight and humour while sharing our combined ideas for effective techniques to improved health. View the event listing on our website, complete with the speaker's biography. Family, friends, caregivers and new members are always welcome! St. Paul's Hospital Renal Dietitians have created two cooking demonstration videos based on a series of cooking classes they hosted. The kidney-friendly recipes are quick, easy to follow and have common ingredients so patients can enjoy a delicious and nutritious meal without hours in the kitchen. Watch a video on breakfast ideas here. Watch a video on 30-minute meals here.